Red pesto made with extra virgin olive oil (33%), sundried tomatoes, basil and a mix of Italian hard cheeses. 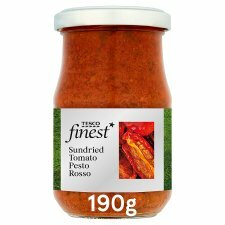 Sundried tomatoes, pine nuts and tangy Italian cheese for intense richness. INGREDIENTS: Extra Virgin Olive Oil, Water, Tomato Paste, Sundried Tomatoes (9%), Basil (6%), Tomato Purée, Pecorino Romano Cheese (Milk) (3.5%), Parmigiano Reggiano Cheese (Milk) (2%), Pine Nuts, Salt, Sugar, Garlic Powder, Acidity Regulator (Lactic Acid), Antioxidant (Ascorbic Acid), Colour (Paprika Extract). Store in a cool, dry place. Once opened, keep refrigerated and consume within 2 weeks.